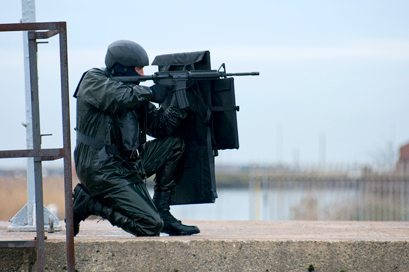 The C-BASS (Compact Ballistic Amphibious Shield System) is a folding lightweight and buoyant shield offering today’s operator a new compact alternative that can be used proficiently in demanding operational conditions. With a carrying harness and removable sections, the C-BASS has been designed with ergonomics in mind offering the user greater opportunities for use and protection. 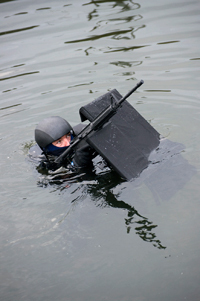 The shield’s buoyancy enables surface or subsurface swimming whilst having the shield tactically deployed for protection. The harness offers ease of use whilst manoeuvring such as fast roping and climbing insertions, complemented by its lightweight design. 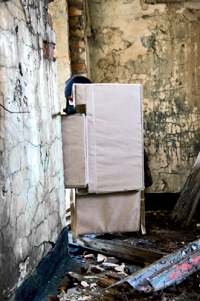 The folding sections also enhance ease of movement whilst approaching confined spaces such as windows or ships bulkhead doors. The C-BASS is currently offered in two different commercial off the shelf (COTS) formats, with an extended version (not pictured) being specifically designed for use in confined aircraft isles and ships gangways. 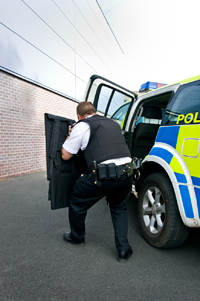 For information on the protection level of our ballistic shields and for prices, please Contact Us.